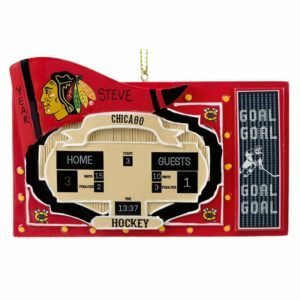 Celebrate your favorite NHL team with a Chicago Blackhawks themed ornament from Personalized Ornaments For You. 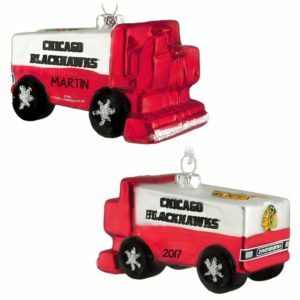 Choose from a keepsake bearing the Blackhawks logo, or one of our ice hockey themed ornaments that we hand customize for you! 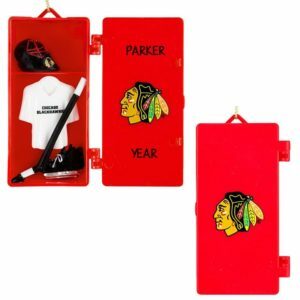 Imagine your child’s name, date and Chicago Blackhawks on one of our ice hockey players! This is a great way to commemorate their first professional ice hockey game. We have goalies too! If you are a diehard fan, choose from our male or female fan figures, which can bear your name, date and favorite sports team. If you visited Illinois and took in a Cubs, White Sox, Bears, Bulls or Blackhawks game, commemorate the experience with a IL shaped ornament which can be personalized to your specifications. 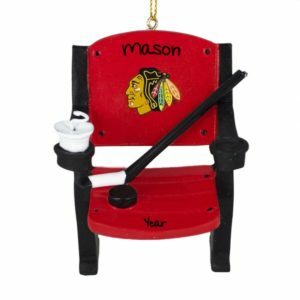 Any of our ice hockey themed ornaments make great gifts for teams and coaches as well. So skate on over to our ice hockey collection and score one today!